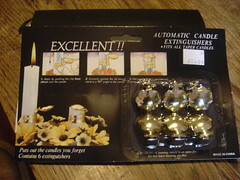 We took Barb and Des to Blakemere Craft Centre...and in the candle shop I found these EXCELLENT!! devices. They work really well..but I wouldn't rely on one. 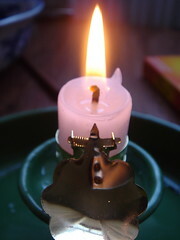 1.Apply by pushing the clip from above over the candle. 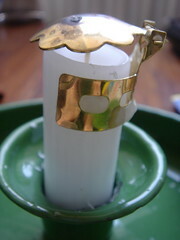 2.Correctly applied the lid should stand at 90 degree angle to the candle. 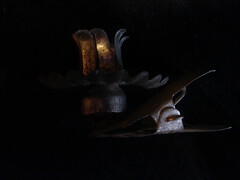 3.The candle flame is automatically extinguished at the level of the clip. Puts out the candles you forget.
" CAUTION! 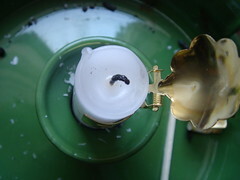 A burning candle is an open fire. Do not leave burning candles." 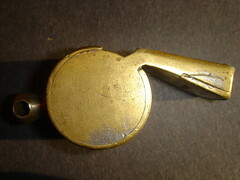 From above in correct position. This isn't on right...it'll never work.. Simple spring closes the lid. 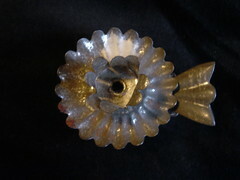 The top clicks down and puts out the candle. We ventured out to a freezing cold boot fair early this morning at Witton Albion football club. 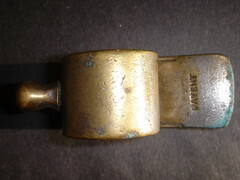 It was worth scraping the ice off the car...found this wonderful brass refs whistle. Wonder how many football matches this controlled? 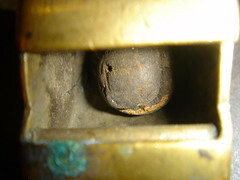 Managed to get a photo of the "pea" inside that wobbles about and makes the trill. Found this on Crewe junk market today. 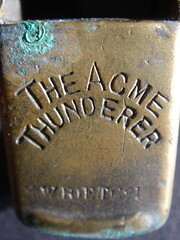 This threader is made from thin blackened steel. 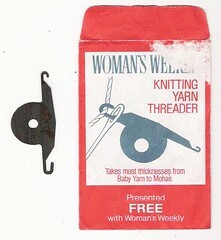 "Takes most thicknesses from Baby yarn to Mohair." "Presented FREE with Womans Weekly"
in an age when that would have been a good thing. 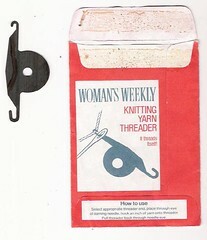 select appropriate threader end, place through eye of darning needle, hook an inch of yarn onto threader. 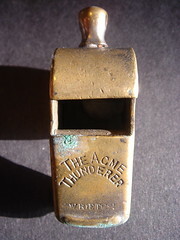 Pull threader back through needle eye. On a day out to Lillehammer (we were staying in Hamar) we found a lovely shop that sold a mixture of real and mock antiques. 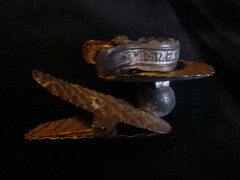 On the counter were these very old Xmas candle holders. The lady there didn't know how much they were and saidshe would try and find out if we could come back in an hour. and to my delight they only cost 30 Krona each...(about £3)..which for Norway is cheap.. I got three and gave one to Esther who came up with a much better use for it. 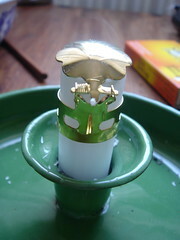 Both holders have a ball and socket joint which allows them to swivvel...bit of a fire hazard on a tree though. 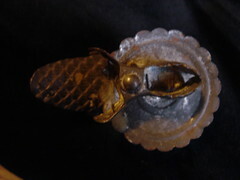 One of the Xmas candle holders I found in a shop in Lillehammer,Norway. 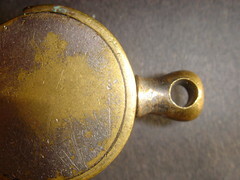 View looking down onto the candle holder. 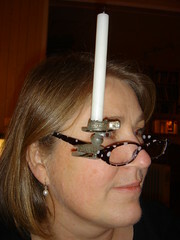 Esther models a new use for the Xmas tree candle holder..
A reading light for power cuts.